Yeah, I know, today’s recipe is kind of long but I’ve been watching another reality TV cooking competition. The Taste on ABC is only mildly interesting and I don’t think it will last, but I watched it long enough to think, once again, that I could whip up a fabulous meal in about the time it takes to brew a cup of tea. With clock ticking, a contestant races around the kitchen gathering ingredients and in a minute or so, a portion of seared scallops with corn succotash and habanero verde appears on a spoon. That’s the gimmick – judges taste just one spoonful. Most of the contestants aren’t even pros, but they sure seem to be fast. The longer I watch the more I believe that I, too, can make Moroccan-scented filet mignon with parsnip puree, roasted beets and sugar snap peas in harissa butter in less than an hour. Heck, why not whip up dessert, too? So with a fennel bulb and two thick boneless pork chops in the fridge, I figured I’d knock out Parmesan-crusted pork over roasted butternut squash polenta with fennel cream sauce. The menu just came to me, and I made up the recipes as I went along. Like the menus and recipes seem to come to the contestants on The Taste. Huh. I roasted the cubes of squash to caramelize the edges. I roasted the fennel until soft, then chopped the bulb, sauteed it with onions in a skillet, added wine and simmered until the wine evaporated. The wine trick would give the fennel sauce a deep, luscious flavor. At that point, I said to hell with it. That was enough cooking for one day. I stashed the fennel and squash in the fridge and heated a frozen pizza for dinner. The next day I made some no-stir polenta with Parmesan and butter, swirled in the squash cubes and poured the mixture into a pan to cool. 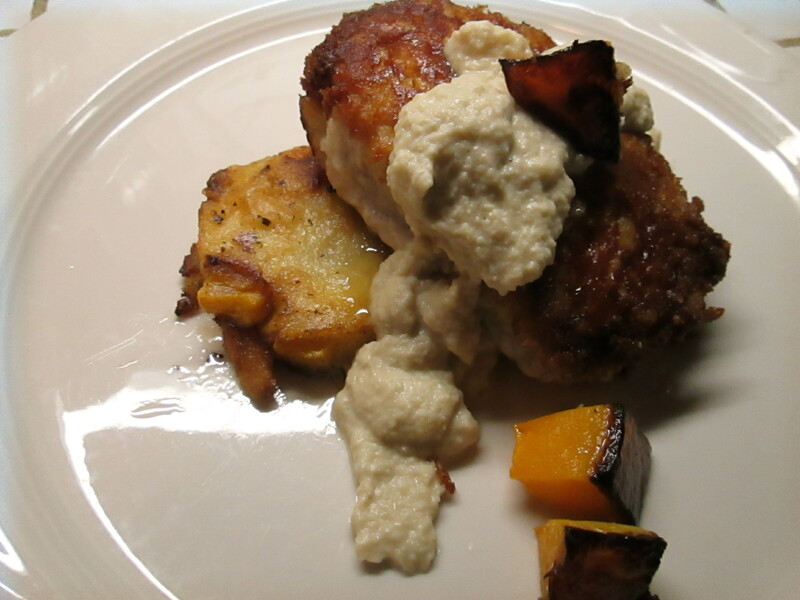 I coated the thick chops with Parmesan and panko, and pureed the fennel mixture with cream until silky. That was enough cooking for awhile. Later that night when Tony came home from the restaurant I browned the chops and finished them in the oven. They turned out gloriously golden and crisp, with a juicy interior. I punched out circles of the butternut polenta with a biscuit cutter and browned them in butter. They were so good I ate the leftovers for breakfast the next day. I heated the fennel sauce (seriously fabulous) in the microwave and then assembled everything on a plate: darling polenta circles, then chops, then a ribbon of fennel sauce. Dinner was incredible. But it took two days to prepare, folks. I suppose if I cooked at full steam I could have made the meal in about an hour and a half. But life is too short for that kind of frenzy. Luckily, each component of this dish is delicious on its own, so if you try these recipes – and I urge you to do so — either spread the cooking over two days or use just one element in a meal. Again, I apologize. I gotta stop watching those cooking contests. Heat oven to 400 degrees. Pour olive oil onto a rimmed baking sheet. Add squash cubes and toss in oil to coat both squash and baking sheet. Sprinkle lightly with salt. Bake at 400 degrees for 30 to 45 minutes, until cubes are tender and golden brown on the bottom. Transfer to a bowl and set aside. Bring water to a boil in a deep saucepan. Slowly add cornmeal a few grains at a time, stirring constantly to prevent cornmeal from clumping. When all cornmeal has been added, stir in salt and continue to stir for 5 minutes, until very creamy. Cover and cook over low heat, stirring occasionally, for 15 to 20 minutes. Add butter, cheese and sage, stirring until ingredients are thoroughly incorporated. Gently stir in roasted squash cubes. Pour into a buttered, 9-by-12-inch baking dish. Smooth top and set aside to cool. Polenta may be made a day in advance and refrigerated at this point. About 10 minutes before serving, cut polenta into 21/2-inch circles with a biscuit cutter (or just cut into squares). Heat butter and olive oil in a large skillet and fry polenta until crisp and golden brown on both sides. Makes enough for 6 to 8 servings. Wash fennel and trim away any blemishes, as well as stalks if present. Dry with a paper towel. Cut in half vertically. Coat a baking sheet and the fennel bulb with olive oil. Place cut sides down on sheet. Bake at 350 degrees for about 45 minutes, or until very tender. When cool enough to handle, roughly chop. Combine 1 tablespoon olive oil and the butter in a medium skillet. Add onions and saute over medium heat until very soft. Add fennel and toss with the onions for a minute. Add white wine and simmer until the wine has evaporated. Season with salt and pepper. Puree fennel-onion mixture in a blender while slowly adding half and half. Process until texture is whipped and silky-smooth. Makes about 1 1/2 cups. Season chops on both sides with salt and pepper. Line up shallow bowls of the Parmesan, egg and panko. Dip chops on both sides in egg, sprinkle both sides with Parmesan, then dip in bread crumbs, pressing so that they adhere to the meat. May be prepared to this point several hours in advance and refrigerated. Bring chops to room temperature before proceeding. Note: Chop recipe may be doubled or tripled. To assemble: Place three rounds of polenta on each dinner plate. Top with pork chops and drape a ribbon of sauce (reheated if necessary in the microwave) over the chops. Serve immediately. A 14-ounce block of Bulgarian feta cheese for $4.99 and a 25-ounce jar of large capers in brine for $2.99, both from Near East Market at 3461 Hudson Drive (at Graham Road) in Cuyahoga Falls. Each week I get at least one automated email from a subscriber alerting me to a new email address, and asking that I update my list. I would if I could, but I never see my subscriber list and wouldn’t know how to change an email address even if I had access to it. Tech wizards employed by my publisher, Mimi Vanderhaven, handle all that. If you ever change your email address, here’s how to make sure you keep getting See Jane Cook: Unsubscribe by clicking on that link at the bottom of any newsletter. Then sign up with your new email at http://www.janesnowtoday.com. Thanks. I’m responding to your plea for the recipe for Bill Crocker’s Mozzarella Sticks. I have the newspaper article that says the late, great Thurman Munson got the recipe from a chef in New York City. Slice bread as thinly as possible. Melt butter, add flour, then add heated milk to butter-flour mixture. Stir with wire whisk until lumps disappear. Add cheese, horseradish, and bouillon cube (I would probably use beef base). Cook over low heat for 10 minutes. Cool. Spread mixture on bread slices and roll up, filling on the inside. Deep fry in 350-degree oil until golden brown. Serve the sticks sprinkled with Parmesan cheese and accompanied by lemon wedge. Hope Carolyn will make them and enjoy them! Dear Shirley: I remember making the mozzarella sticks, but I didn’t remember the bit about Munson, nor that the ingredients included a bouillon cube. Thank you so much for retrieving this from your files. Thanks also to Becky Tompkins, who sent a copy. Dear Pat: Wow, this menu sounds wonderful. I can’t thank you enough for the note, and for the kind words about my new sponsor, Sherman Provisions. They deserve it. To Anna from Strongsville, you can freeze pretzels, potato chips etc. also. Thanks for the popcorn tip, now if I could only stop eating the whole bowl I will try it! Dear Carolyn: Well, maybe knowing that I can freeze chips and pretzels will stop me from finishing off the bag. Popcorn, I’m afraid, will always be consumed in one sitting.